An oral history of Garnett White, conducted by Joseph Morris on October 13, 2011. Born in St. Augustine, Florida, White moved with his family to Sanford at a young age. In the interview, he discusses attending Southside Elementary School during World War II, running a paper route and riding bikes around Sanford, his experiences as a real estate broker, Sanford's celery industry, the history of Chase and Company, Red Hill Groves and the citrus industry, his service in the U.S. Navy, his civic service, and his family. Oral history interview of Garnett White Interview conducted by Joseph Morris at the Museum of Seminole County History in Sanford, Florida. White, Garnett. Interviewed by Joseph Morris. October 13, 2011. Audio record available. Museum of Seminole County History, Sanford, Florida. Original 16-page digital transcript by Savannah Vickers: White, Garnett. Interviewed by Joseph Morris. October 13, 2011. Audio record available. Museum of Seminole County History, Sanford, Florida. Linda McKnight Batman Oral History Project Collection, Seminole County Collection, RICHES of Central Florida. Originally created by Joseph Morris and Garnett White. "About Red Hill Groves." Red Hill Groves. http://www.redhillgroves.com/#!our-story/cqi7. This is an interview with Garnett White. This interview is being conducted on October 13th, 2011, at the Museum of Seminole County History. The interviewer is Joseph Morris, representing the Linda McKnight Batman Oral History Project for the Historical Society of Central Florida. Sir, could you tell us a little bit about yourself? Well, yes. I was born in St. Augustine, Florida. My father was a butcher—or meat-cutter, I guess we would call it. We moved to Sanford when I was maybe three years old. I remember when I was four years old going to a birthday party to a neighbor girl—and as I’ve over the years have tried to think when that was. I believe I was about four years old. We lived on [West] Tenth Street in Sanford, and my father worked as a butcher—meat-cutter—and he moved here from southwest Georgia—called Pelham, Georgia—and he went to work here for a man from Pelham, Georgia, named Bluitt Stevens. We lived on Tenth Street until I was in about second grade, and my father had a house built on Tenth and [South] Laurel Avenue, and he still worked for Mr. Stevens. Mr. Stevens owned a store in Downtown Sanford where the Colonial Room Restaurant is now, and it was called Triple S Groceteria—the red front store, and that time is about the time I started school, and I went to Southside Elementary [School], where my first grade teacher was a Mrs. Jacobs, and the principal was Mrs. Harrington. And I remember those times. I went up through the fourth grade. And in the second grade, Elizabeth Wigham was my teacher. And the third grade, was a lady named Bobbi Goff. And the fourth grade, was a lady named Bobbi Goff. And this was only about three—maybe four—blocks from my home, and back then, of course, you didn’t have buses like that, and I remember walking to school when I’m six years old, and of course today, they don’t allow that type of thing, but it was not out of the ordinary at all. One memory I have of that is that the lunch. The lunches cost 11 cents. You got a blue ticket for five cents, and that gave you the food—a roll usually, amongst other things—and milk was six cents. That was a yellow ticket. And I think you could get all five for 25—all five of a week for 25 cents, as well as I remember. But most people brought their own lunches. They did buy milk for six cents. And that was kind of interesting. This would have been in about 1940 or ’41, and the Second World War started in 1941, and I remember big piles of metal, particularly aluminum, and rubber. This was to help the war effort, with aluminum to build airplanes out of—and I don’t know what they did with the rubber. But that was my first recollection of playing baseball—or softball, I guess it was—was at Southside Elementary. Then we, uh—my grandfather was from Athens, Georgia, and he had his arm taken off. He had cancer, and my mother went up there to take care of him for about six weeks, and I, of course, went with her, and so I went to school for that six weeks in Winterville, Georgia. Of course, coming back to Sanford, continued with school at—we called it [Sanford] “Grammar School,” which is now the Student Museum on Seventh Street and Elm Avenue in Sanford. They’d talk about it being so old, and so on. Of course, that was 70 years ago almost, but it doesn’t look any different today than it did back then. And they’d talk about it being old, and so on and so forth. Didn’t mean anything to us. You know, you had a seat and that was it. You know, scribbling all over the desks with knives. So on. So, you know, times—it just did not mean anything to us, as far as how new something was, and apparently nowadays you got to have a new school, or they don’t—or the children don’t accomplish as much, I guess, is a word [laughs]. But then—about when I was 11 years old, I got a paper route. Remember, this is during the war—the Second World War. And I got a paper route delivering The Florida Times-Union, which is the Jacksonville paper. They weren’t—the Sanford paper came out in the afternoon, and it was very hard to get newspaper or newsprint, and presses would break down, and I delivered The Sanford Herald also, about that time, and they had brown paper. It looked like the brown paper that’s used by butchers to wrap meat in, and that was kind of odd. And I’ve talked to people in the last few years, and they remember the paper being printed on that brown paper. But something that is really kind of interesting is, over the years, I have talked and had coffee with Senator Mac Cleaver, and we would always talk about our paper routes. He was older than I was, but it never changes. And we would talk about who lived in certain houses, and where they would leave the money for the newspaper, and they still—me being eight years younger than Mac—they still left it at the same place—on the banister, on the porch, that type of thing. Of course, after that, we went to Sanford Junior High School, which was over on Ninth Street and Sanford Avenue, and I guess that’s when we started growing up a little bit, and getting around town on our bicycles more than we did when we were very young. But we would ride our bikes down to the lakefront—which is Lake Monroe, down where the motel is now—and we’d jump off the seawall. It was there at that time. We’d jump off. We’d swim out to one of the beacons or markers out in the water. Another time—me and another fellow—we swam across the lake all the way to the power plant, and truthfully, we walked most of the way. It was very shallow out in the middle. We didn’t really walk. We just kind of touched bottom, and my father picked us up on the other side at the power plant on the north side of Lake Monroe. But those were good times. It was not out of the ordinary to go downtown and walk around. Go through the alleys and see what people—or I’m talking about stores—had thrown away and did we want it, and that sort of thing, you know. It was—I really remember one time we went behind a place called [B. L.] Perkins. That was a men’s store. And there was a book of swaths of material that you could pick out what you—the men—would want their suits made out of. And we thought that—they were little old things about three by three inches, about three inches—and we thought that was a big deal. We took those home, and I think our parents threw them away. Anyway, as time goes on, in high school, went further from home, and went through all of the things, I guess, that happen in high school. And immediately after that, I joined the Navy and spent my hitch on board a fleet OR, and this would have been in 1950-51. But going all over town with paper routes, you just got to where you saw things you would never have seen, or people that you talked to or knew—you knew who they were, uh, if you didn’t have a paper route. And then, as time goes on and I got out of the Navy, I got my—went to the real estate—school of real estate law—and, uh, got my broker’s license. And shortly thereafter, I met my wife, my now-wife. And we got married and had three children. As far as the real estate business is concerned, that was 50—I still have a license—and that’s 56 years ago. That’s a long time. I actually made a living at it. Only way I’ve made a living, up until about 6-7 years ago. And I’m 78 now, so it was time. But in the meantime, there’s quite a bit of property—not houses, but I never was much in the house business—that I’ve sold over that period of time three different times. There was one piece of property I sold three times. All three times were to people named Hall, and that they had never known each other, of course. So it’s interesting. And land would sell for—I can remember appraising. I did quite a bit of appraisals for the banks in Sanford and the First Federal Savings & Loan, and that really got me back into going to places that you normally wouldn’t go if you weren’t in the real estate business. As time goes on, I was handling acreage, as I said, and they pretty well quit farming in Sanford. So muck farms in Zellwood and down in Lake Okeechobee pretty well had an end to the farming in the area. It’s my understanding from the owner of Chase and Co[mpany], which was a very large company—probably the largest farmer in Central Florida back in the ‘20s and—but the last celery grown in the Sanford area was in 1975. Now that came from the owner, president of Chase and Co., and his name was Sydney Chase—Sydney [Octavius] Chase, Jr. His father and his father’s brother are the ones that started Chase and Co.
Something really interesting is that, of course, all of this product had to be shipped by railroad. You know, you didn’t have trucks like you have today. You just didn’t put things on a truck, haul it to New York. It all had to go to—through the railroad, and so most every packinghouse—that type of thing—was located where it could be sent by the railroad. And celery—and cabbage, cucumbers, all of those things—required refrigeration. Well, if you’ll think back to 1925, you didn’t have no refrigeration. But they was able to make ice in big 300-pound “slabs” I’ll call them. Chase and Co. had an icehouse out on the east side of Sanford. There was another one in Ransidey[? ], which is in Monroe, Florida, just west of Sanford on the railroad. And you had railroad cars called “reefer” cars, and that stood for “refrigerator.” And they would put these big 300-pound slabs of ice in these railroad cars. They were all painted yellow, and during the summer, there was a siding going—railroad siding going from Sanford Avenue out to the Chase washhouse, which is on Cameron Avenue. And that’s a long ways. And they would store these reefer cars all summer long, because they had no use for them except to ship produce, and of course, you didn’t grow produce in the summertime. Come summertime, in like May or something, would be the last that they grew until next fall and next winter. But I remember all those yellow reefer cars there, and I’m sure many other people that was[sic] out in that area remember just sitting on the siding and waiting on the next year. But there was a lot of—another thing is interesting is it seems as though to me that the people that owned automobiles—and their kids went to school with me—they were farmers. And other people didn’t have automobiles. My father did not have an automobile until 1946, which was right after the war, and things became available to sell, particularly meat products. But all of that—getting back to the real estate business, I would come across and I knew a lot of people in the citrus business. And as time went on, I sold some citrus groves, and I bought some citrus groves, and I leased several citrus groves. And our—my wife and I’s—two children kind of grew up knowing what citrus was, and you could go on the Internet under White’s Red Hill Groves and read about us, and it’ll tell you all you need to know about our family and the citrus business. But it’s been 29 years now since we purchased a gift fruit packinghouse called Red Hill Groves. So we have set out new trees and taken care of old trees, and picked and packed, and shipped citrus all over the United States. I would say there’s not a state we haven’t shipped fruit to. But times have changed considerably, since probably 1985 and things started booming—this is because of Disney—and started booming. And another thing that’s kind of interesting here is that when I went to high school, Seminole High School had a hundred people in each class. And Crooms Academy had maybe 30, and Oviedo [High School] may have 15, and Longwood, which is called Lyman High School, may have 15. And look at it today, there’s what? Eleven high schools, each one of them got three thousand in that school. So that’s really what started happening during those years, and those of course, just kind of bloomed. Really interested—I was very active in the civic things in the city—Chamber of Commerce, the Jaycees, and that type of thing. As time goes on, I think I’ve been through four—they call them—they don’t call them “depressions,” whatever they call them. Recessions. And I’ve been through four of them. And I can remember trying to sell houses for a hundred dollars down and making a commission. There ain’t much left to make a commission out of. But times would get better, and then you’d start selling again. People would start buying again. I guess time is going to tell about the one we’re in now in 2011. But anyway, it was a good life that I lived in Sanford. It is much different. Traffic, as everybody knows, gets on your nerves. But all three of our children live in Sanford, while our packinghouse is in Orlando. The boys go back and forth every day, and our daughter works for Bayer Corporation in the animal health division. So anyway, we—my wife and I—both feel that our time growing up in Sanford, and spending our entire life here, except for those maybe three years, has been good, and as good as any place we could have settled. I don’t know that we ever considered moving from Sanford, neither of us. But I guess that’s pretty well the story. I have a couple questions, sir. Okay, sir. You talked a great deal earlier about the paper route you ran as a kid. Was that a great experience for you? Because you spent a lot of time discussing how you met and saw a lot of things. Oh, well, sure! There’s a little story that goes along with that, was we delivered The Florida Times-Union, and we had about 11 or 12 paper boys. And you’d go up and down. Each one of us had about a hundred customers. And you’d go up and down the streets, and there was a policeman that walked the streets at night named Harriet. And Mr. Harriet had a dog that went with him, because Mr. Harriet walked up and down the alleys, and all the way generally throughout the whole downtown area. Well, a friend of mine who lived four or five houses from me had a dog, and the dog would go with him on his paper route. Well, it seems as though Mr. Harriet’s dog would jump on him and bite him and all of this sort of stuff. So my friend bought a collar that had, oh, pieces of metal like a nail sticking out the side—sticking on it. Well, he sharpened those up. And we’re all sitting there one morning, waiting for him to come with his dog. He’d always come around this corner—First Street and Oak Avenue—and he would come around that corner. Well, we’re waiting to see Mr. Harriet’s dog jump on this dog’s neck with those sharp barbs, and he did and he went off just howling. And Mr. Harriet came out. There was a bakery there, and everybody—paper boys—we would go in there five o’clock in the morning and get day-old donuts, and so would Mr. Harriet, and he come out of there just raising Cain about who hit his dog. But that was interesting. And I guess when I was a senior in high school, I had a car route, and I went to Monroe, Paola, went all the way to Wekiva River, and back up through Monroe. And a man named Bass—he was the last one on my route. And he was a farmer, so he told the paper manager that I was just getting there too late, that if I couldn’t get there five o’clock in the morning, that he wasn’t going to take the paper no more. So I had to rearrange my route so I could get him first instead of last. But that was interesting in that too. And the people—there’s still people around that deliver papers. We talk about it, every now and then, when you see somebody. But that was good experience, really was. And you did that from when you were younger all the way through high school, sir? Not all that time, no. But I got a paper route when I was 11 years old, so that’s gonna put me in the fifth grade. And I remember having a paper route in the seventh grade. I don’t think I had any until I was senior, from the seventh until that time. Because like, a lot of—something very interesting. I worked in a grocery store. And you worked Thursday morning from about four o’clock in the morning, and Friday afternoon, and all day Saturday, for four dollars and something. Well, a friend of mine was caddying at the golf course, and he said, “Oh,” you know, “I don’t work but 4-5 hours and I make more than that.” So I went out and started caddying. So I caddied for several years. Because you made more money. You carry those bags around. If you did it twice, they called it “double looping,” you made more money than you would at the grocery store. But anyway, I think everybody sooner or later worked in a grocery store. I don’t think that’s changed much, sir. I don’t think that’s changed much. I’ve worked in a couple grocery stores. No. No. I see the kids in there now, and they’re—course we didn’t stay there until all night long like they do now. They put up stock now at night, and we didn’t do that. Anyway, it was good. Good times. All right. You mentioned you were in the Navy, sir. How long were you in the Navy for? I was in the Navy for one hitch. I was a quartermaster. One hitch is when I was on something called “minority cruise,” and that you means you join after you’re 18 and you get out when you’re 21, instead of a flat three years—four years, whatever it is. And I joined when I was a senior in high school, and this wasn’t too long after the war. This would be in 1950. And the war was over in ’45. So anyway—but I was a quartermaster. A quartermaster is someone who does signals and navigation, that sort of thing. And a fleet oiler is different than a tanker. A tanker hauls fuel from one place to another, and a[sic] oiler refuels ships at sea when you’re both underway—you’re both moving. And that’s what an oiler is. You still have oiler today, and always will, because you need it in the middle of the ocean just as you do alongside a dock. And I liked that—and I may have stayed in longer except the ship was going on Operation Deep Freeze, and that was in Antarctica, and I wasn’t going there, ‘cause I’d heard the stories about it before. Everything’s full of ice and all of that. Anyway, that was my military experience. Did you travel anywhere on that, at that time, sir? Oh yeah, sure. We went—first time when I went on board there, we went to New York City, which of course, here I am. Never been to New York City. We stayed there for like two days. Then we went to the Caribbean [Sea], down to South America to the Azores. Just that type—wherever. Maybe just sit out in the middle of the ocean waiting on a convoy to come that needed fuel. I mean, that was our job. Right, sir. Did you enjoy your time in the military—the Navy? Just didn’t want to go to Antarctica. I didn’t want to go to Antarctica, and probably if I’d have stayed in longer than that, I’d have stayed. I would have stayed to retire. But I didn’t, and not been disappointed in that at all. Okay, sir. You also mentioned you worked with civic duties for a while. So tell me a little more about that. Well, 1963, I started civic-type stuff. Well, I was a Boy Scout. And I’ll have to go through the Boy Scouts [of America] first. But the Boy Scouts—I was a[sic] Eagle Scout, and I worked at summer camp as a waterfront director-type person. I guess I was 16 then, maybe 17. Sixteen and seventeen. I worked two years, one at Camp Wewa over in Apopka. The other one was Camp La-No-Che. Excuse me, Camp La-No-Che wasn’t open then. See, that’s 50 years ago, and most people never heard of Doe Lake [Recreation Area], and Doe Lake was in Ocala [National] Forest. And that was a Boy Scout camp and I worked there at that time. But I was a[sic] Eagle Scout, and that was a big deal to me. And we didn’t have many Eagle Scouts around here. Well, around anywhere. That was good. Yeah. You asked a question before that. What was that? Oh. Well, in the Boy Scouts, believe it or not, we actually did a lot of things civic-wise. But I was president of the Sanford-Seminole County Jaycees in 1963, and the Jaycees were very active at that time. Invited, I guess, to be a Jaycee. And then, I was president of the Seminole County union of the American Cancer Society, and I was president of the Greater Sanford [Regional] Chamber of Commerce. Prior to that, it was the Sanford-Seminole County Chamber of Commerce, and I was a director for 25 years of the Chamber. So, you know, there were those. 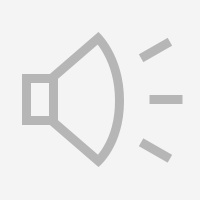 I was a bank director for 15 years. Served on the board of Seminole State College, as vice-chairman of the board for however many years. I don’t remember. So that was civic-type stuff. Okay, sir. Sounds like you were very busy. Yeah. I was busy. I was busy. Knew a lot of people. Most of them are dead now, but, uh, and I’ll join them before too many years. Maybe tomorrow [laughs]. That’s why we’re getting this down today, sir. Get that out today. Okay. Could you tell me a little bit about your family? Your wife’s name, how you met her, and then your children’s names. Yes. I’d gotten out of the Navy, and just got out really, and me and another fellow went to Leesburg High School—to a football game. This was in September, before—after—I had gotten out of the service in August, I guess. Anyway, this girl was a cheerleader, and had black hair. And afterwards, you always used to have dances always—and out of town also. And back then, the girl cheerleaders would always go to the dance, and so me and this fellow went also. And I met her, and then—from then on, had a few dates with her. And anyway, three or four years later, we got married. We have two sons. One’s 54, one’s 53. Have a daughter about 44—something. And the boys run the packinghouse. Have for 20. I say “running” —that’s only partially, mostly. They’ve—that’s 29 years. And a daughter that works for Bayer in the animal health division. Anyway. I guess that’s it. And got grandchildren [laughs]. Well, three. Three boy grandchildren. And one of them works for the city in Palm Coast, and the other one works for the car place—Gibson [Truck World]—down here, and the other one’s thirteen. He goes to school. Okay. Is it okay if we get your wife’s name and your children’s names? Paulette. Paulette. My wife’s name was Paulette Casen. It’s Paulette White, of course. And the children are Ed [White], Ted [White], and Judy [White]. And that’s their names. Yes. Eddie, Teddy. [laughs] Yes. Ed, Ted, and Judy. Do they still respond to Eddie and Teddy? Oh, yeah, sure. Sure, sure, sure. Matter of fact, people their age call them Eddie and Teddy. But, you know, they have a lot of friends, since they’ve lived here. Yeah. They’ve lived here except when they went to college. Eddie graduated from Stetson [University]. And Judy graduated from [University of] Florida. One of the grandsons graduated from Florida and has a degree in architecture. I was telling a story to a fellow about architecture, and I was telling him I knew nothing about computer[sic]. I do know how to turn it on. But I said I have a grandson that has a degree in architecture, and he has never picked up a pen or a pencil. It’s all down on the computer, every bit of it. It’s kind of hard for people my age to think that—that you’re actually gonna draw a plan for a building with a computer, instead of a pencil [laughs]. The, uh—one of the things you mentioned earlier that really caught my attention was you said a lot of farmers had cars. Is that—do I remember that correctly? During certain periods, they were well-off. Yes. And it was told to me that a farmer in the late ‘30s could make a living on ten acres of celery, and that’s not very much, but he couldn’t do that today. Same token. I’ve sold—I’ve sold property to people that owned an orange grove and did all of the work their self, and they had 20 acres, and they made a good living. They had a car, and made a good living on 20 acres. But they did all the work their self. They didn’t have somebody else doing the work. And so, you know, there’s[sic] certain jobs that—if you’re cut out for it. Not everybody’s cut out to be a farmer. A lot of people are going to have to start thinking about it though, because somebody’s got to grow food to eat. Sir, and I do like to eat. And everybody likes to eat. And the truth of the matter is there’s a lot of fussing going on now. People don’t like—well, one thing is dust. They don’t like the dust that farmers create when they plow their field. That’s the EPA—Environmental Protection Agency—and they want to stop that. Well, I don’t know how you’re gonna eat if you stop farm dust. But I’m talking out of bounds here. Still interesting to hear, sir. But that’s the way farmers feel. Although we consider ourselves farmers, we’re not farmers in the cattle business or corn business. We’re in the citrus business. But I guess you could say we could be in the citrus business without growing any of our own. We could buy it from somebody else, and pack it, ship it, and that would work, you know. But we do it all. Okay, sir. My last question, if it’s all right with you, could you just give me a brief overview of how you actually grow citrus—the process for it. Well, you plant a tree, and you grow it, and it ends up and blooms, and has fruit on it. That’s about it. It’s, you know—it’s just like any farming, and I think that’s what you’d have to say. It’s, you know—you’ve got to prepare the soil, if you want to call it. In the citrus business, you plant small trees—three feet tall—and after about five years, they have some oranges on them. Not very many, but enough, considered that you’ve got some fruit. And the maximum is about 20 years. And during this period of time, you fertilize them, and you prune them, and you just generally take care of them like a baby. And things change in the business, such as—used to plant them 35 feet apart, and 35 feet in all directions, because the way that you get the weeds down was with a disc or harrow. So you went up and down the rows in one direction, and then across the rows in another directions to kill the weeds. And nowadays, you don’t do it that way. You plant them 10 feet apart in a row, and then you use chemicals to kill the weeds. And you also hedge them, because you don’t have that 35 feet. You have 10 feet. And you got big machines with big, round saws on it—three foot—and they’re spinning, and you go up and down the rows and make a hedge out of it. And that’s what’s really changed in the citrus business in the way that you grow citrus. Plus, used to—you didn’t have very many ways to keep the fruit clean. Everybody wants to have a blemish-free piece of fruit. It don’t work that way. A friend of mine who used to disc and take care of the growth—first one I ever had—named Carl McWaters. His family was in the business, and he was a caretaker. He said, “Well, Mr. White,” said, “You know, my father worked for that packinghouse over there in Umatilla.” And whenever they had a—one of the diseases—not a disease—one of the bugs that you have. It’s called a “rust mite.” And a rust mite makes fruit look rusty. And he said, “Whenever we’d have a bad rust mite year, we’d go ahead and ship them up north anyway, and called them ‘Golden Rusty.’” Which made them sound a whole lot better than a rusty piece of fruit. So that was kind of interesting. Because they didn’t have any way to kill those rust mites. And nowadays, you know, it’s an entire—oh, I don’t, what I want to say it. Crop protection, whether it’s citrus or other crops. It’s a whole world of taking care of those problems. In the United States and the agricultural business, the idea is to get rid of a problem instead of live with the problem. And that’s true with a lot of things, not just citrus. But, you know, if you got rust mites, you know—“Well, let’s get rid of those rust mites.” So you got 50 different companies out there trying to have chemicals to get rid of them. In a lot of countries that grow citrus, they don’t do that. They just live with it. And I see nothing wrong with that. But that’s kind of interesting too—how that kind of thing works. But, you know, the companies—some of the largest companies in the world are agricultural chemical companies. That was it for my questions, actually. Did you have anything else you’d like to say? Well, sir, it’s all great. Thank you very much, sir. All right. Nice to talk. Morris, Joseph and White, Garnett. 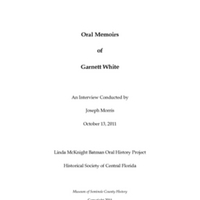 “Oral History of Garnett White.” RICHES of Central Florida accessed April 26, 2019, https://richesmi.cah.ucf.edu/omeka/items/show/4606.